Nestled between the gnarled branches and twisted vines beyond a hidden dirt road in the Hungarian countryside lies a seemingly unremarkable swath of land. Stray chickens roam across the sodden earth and the sound of village dogs barking echoes through the afternoon air and into the surrounding vineyards. "Take three steps forward." Dr. Norbert Pap tells me. I obey, searching for any sign of the structure that brought me from the bustling metropolis of Istanbul to this plot of land. "Now you're standing right in the center of it," he said. I try to imagine four walls around me, walls directed toward Mecca, walls belonging to the tomb of Sultan Suleiman the Magnificent. Those walls, Dr. Pap and his team have discovered through the results of a geophysical survey, are below the earth's surface. The area is called Turbek, deriving from the Turkish word türbe, meaning tomb. It lies just outside Szigetvár, a town with a current population of about 10,000, but which has a past that changed the course of European history. At its height during the 15th and 16th centuries, the Ottoman Empire was one of the most powerful states in the world. Its territory spanned three continents and dozens of modern day nations. But Sultan Suleiman hoped for an even larger dominion. Throughout his reign, Sultan Suleiman endeavored to take the city of Vienna. The successful 1526 Battle of Mohács and the campaigns of 1529 and 1532 fought in modern day Hungary suggested that it was only a matter of time before he reached his goal. By the second half of the 16th century, it became clear to the Sultan that capturing the defending fortress at Szigetvár would be key to this undertaking. The 1566 Siege of Szigetvár was the elderly Sultan's thirteenth and final campaign. A total of 50,000 Ottoman soldiers marched through the hills between the city of Pécs and Szigetvár to reach the fortress, which was surrounded by water at the time. Some 2,300 Hungarian soldiers, including national hero Miklós Zríní, defended the fortress from the Ottomans, who began their attack August 29, the anniversary of the battle of Mohács. The two sides collided for over a week, and the Hungarian supplies of water and gunpowder began to dwindle. At dawn on September 7, as the Ottoman soldiers prepared for their final offensive, Sultan Suleiman died in his tent from natural causes, just two months shy of his 72nd birthday. His magnificent 48-year reign had come to an end. Worried about the reaction of the troops, the Grand Vizier kept Sultan Suleiman's death a secret and the fortress fell by sunset, following one last ditch suicide effort by Zríní and the remaining Hungarian fighters. The Grand Vizier had Sultan Suleiman's body transported to Suleymaniye Mosque in Istanbul. However, Istanbul was distant, and the weather was hot. Consequently the Sultan's heart and other organs were removed in Hungary and, allegedly, buried in a legendary golden casket beneath the tent where he died. The whereabouts of Sultan Suleiman's tomb has been debated for centuries, shrouded in mystery and local legends. "My task was to find the geographical location of the tomb," said Dr. Pap, who is a professor of political and historical geography at the nearby University of Pécs. The search initiative was funded by both the Turkish and Hungarian states, including the Turkish International Cooperation and Development Agency (TIKA), which sponsors social and cultural projects abroad. Dr. Pap explained that an official hunt for the lost tomb began in 1903, with several theories emerging throughout the century. The most prominent theory said the tomb was located under the site of the 18th century church of Saint Mary in Turbek. Another presumption indicated the Sultan's organs were buried at the site of the Turkish-Hungarian Friendship Park, established in 1994 to commemorate Sultan Suleiman's 500th birthday. "My new approach was understanding that the climate and landscape changed a lot in 450 years," said Dr. Pap, "We made a landscape reconstruction and analyzed the written sources including formerly unknown maps." Through this process, Pap and his team were able to rule out the two sites, "Our analysis was that the place by the creek [Friendship Park site] was covered with water. The site of the church was a wet pit. So the two places were excluded." In 2013, the team of researchers spent a total of 350 working days on the field in search of the tomb. "We identified a place four or five kilometers northeast of the Szigetvár fortress. We found an Ottoman ruin field there," explained Dr. Pap. Good news came in December 2014 when results of a survey revealed that the ruin field in Turbek was indeed the home to a building from the era with walls facing toward Mecca. International media caught on to the story as the research team, which started as four people and grew to 20, began to excavate the site. The discovery also caught the attention of local treasure hunters, who would show up at the site with shovels, Dr. Pap explained. "We told them that we didn't need anyone else on the team," the professor joked, adding that the site had to be guarded at night. The team has received DNA samples from Sultan Suleiman's living descendants in hopes of finding a match with any human remains found at the site. Dr. Pap's discovery has resulted in a media blitz. In addition, documentaries and exhibits have reignited interest in the famed Sultan and shined a spotlight on the small Hungarian town. The professor remains humble but passionate about his research, "Documentaries and exhibitions are physical examples of hard work and something that we can be proud of." Remnants from the Ottoman period still dot towns and villages in Hungary today, where six mosques from the 16th century remain intact. Several of those mosques, as well as Ottoman-era çeşmes (fountains) and hamams are found in Pécs, a small city about 30 kilometers from Szigetvár and three hours south of Budapest. Both Pécs and Sigetvár receive a small stream of Turkish visitors each year, but there is potential for the southern Hungarian towns to become significant tourist destinations for Turkish and foreign history-enthusiasts. A university city, Pécs has a present day population of about 145,000 people, consisting of mostly Catholics, but there is also a significant Protestant community. Additionally, about 300 Sunni Muslims, mostly immigrants or faculty at the university, reside in Pécs. Pécs has a history dating back more than 2,000 years, when it was a Roman city called Sopianæ. The Hungarian tribes arrived in the ninth century, 100 years before King Saint Stephen established the Kingdom of Hungary. The Ottomans came to Pécs in 1543 after waging several successful military campaigns in the region. The city became an important Ottoman center, with a culture rooted in Sufism. During the 150-year Turkish occupation of Pécs, churches transformed into mosques, the main street became a bazaar, and Islamic schools were established around the city. The legacy of the Ottomans can be felt in Széchenyi Square, which boasts a decorated city hall and European style hotels and shops, as well as a symbol of the city, the Gazi Kasım Mosque. The mosque was constructed between 1543 and 1546 and remains the finest example of Ottoman architecture in Hungary. The turquoise domed building was converted into a church in 1702, and it continues to be a place of worship today. Pécs is also home to the Yakovali Hasan Pasha Mosque, the most intact Ottoman mosque in Hungary, complete with its minaret. Inside, items from the Turkish government are on display. Turkish tourists would also enjoy visiting the Idris Baba Türbe, the resting place of Idris Baba, an Ottoman healer of the Bektaşi Order, believed to have performed miracles. The domed octagonal structure is outfitted with prayer-mats donated by the Turkish government. Pécs' city park holds the ruins of a Bektaşi religious center, which had previously been a summer palace for the city's ﻿bishop. The city is also dotted with Turkish çeşmes, one of which was preserved through a TIKA project. A short drive from Pécs, the fortress museum in Szigetvár displays information in three languages--Hungarian, English and Turkish. The museum showcases Ottoman relics and holds an impressive weaponry collection. Visitors can walk along the centuries-old fortress walls and may even catch sight of a ﻿reenactor or two. Southern Hungary has a tourist market just waiting to be tapped. The major impediments are infrastructure and funding issues. The local airport is small and undeveloped, but Turkish Airlines has promised to offer direct flights from Istanbul to Pécs if the airport could improve to accommodate a Boeing 747 aircraft. The implementation of direct flights and package tours could transform the region into an inviting cultural capital and attractive tourist destination. 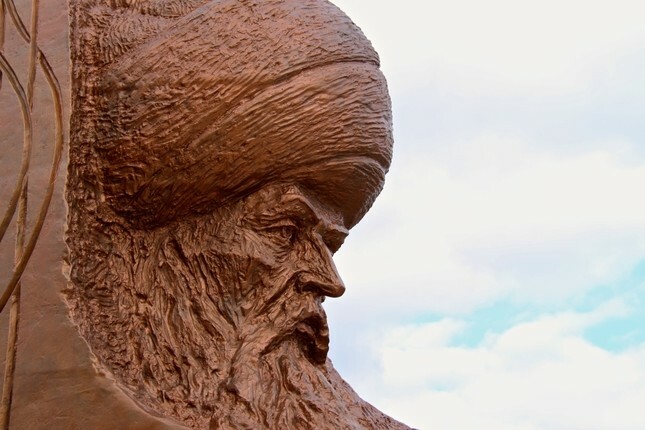 Time will tell if the discovery of Sultan Suleiman's tomb will be the inducement needed to generate a budding new tourist industry in Szigetvár and Pécs. While leading me to the tomb site, Dr. Pap greeted a local vineyard owner on the back country road. The man was clearly used to the professor bringing people into his backyard. I asked Dr. Pap to inquire how the man felt about having the tomb of Sultan Suleiman the Magnificent so close to his property. He shrugged, and with a half-smile said, "I always knew there was a Turkish ruin here."